Although still in my European vacation, I am now sitting in front of a proper computer and can give this post the attention it deserves. I wrote a post acknowledging the Ennie nominations from my blackberry in my hotel room in the dark after a whole day of walking through London, and it came out half assed. That’s why it’s been deleted. These are all wonderful blogs, and I am honored to be nominated amongst them, some of which are considered the elite of the rpg blogging world. I am especially happy for my friend Tracy from sarahdarkmagic.com for the Honorable Mention. Well deserved Tracy, you’ve built something special with your site. Truth be told, I have not heard the majority of nominated podcasts, but that will soon be rectified. So, I won’t lie to you, I am super happy and excited to be nominated. Getting invited to the party is good enough for me, I didn’t start this blog so I could win an award, but I won’t lie either and say I’m not proud of what I’ve accomplished in the past two years. This may even make me go to Gencon, which I wasn’t planning on this year. Voting opens July 16th and runs until the 25th, so go out there and cast your vote. It’s going to be exciting to see who takes it! Congratulations! You’ve put together a great site and have put some great resources out there for all of us. Thanks. Congratulation, Newbie. A nomination well-deserved. How exactly do the nominations work for the Ennies. I’m surprised that Radio Free Hommlet isn’t on the list of nominated podcasts – it’s one of my favourites. Good Luck Newbiedm, I’ll vote for you! @Colmarr – I can answer that since I’m the ENnies Assistant Business Manager. Publishers have to submit their products so the judges can pare them down into nominations the fans vote upon. The submissions for next year will start being accepted after Gen Con. 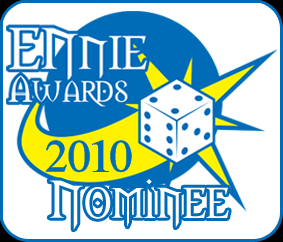 You can learn more at http://www.ennie-awards.com. Well, you really have worked a lot to earn that nomination. 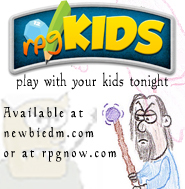 This page have helped us all in this hard journey that’s being a DM, and I really like being part of this community you’ve builded around this blog. Count with my vote, brother of gaming. For both categories. @TonyLaw – Thanks for the quick response! Interesting to know. Congrats, a well deserved nominations. In addition to reading the blog I love to listen to the mini cast. As far as the others nominees, I have critical hit and gnome stew in my book mark bar right next to NewbieDM. Check out Gamer’s haven Podcast they have a great show format and never cease to entertain and their actual plays are all very entertaining to say the least. You have my vote for both categories Newbie Dm!! !